INFERNO. The science centre at the North West University's Mahikeng campus on Wednesday, February 24, 2016. Picture: Kearabetswe via Twitter. 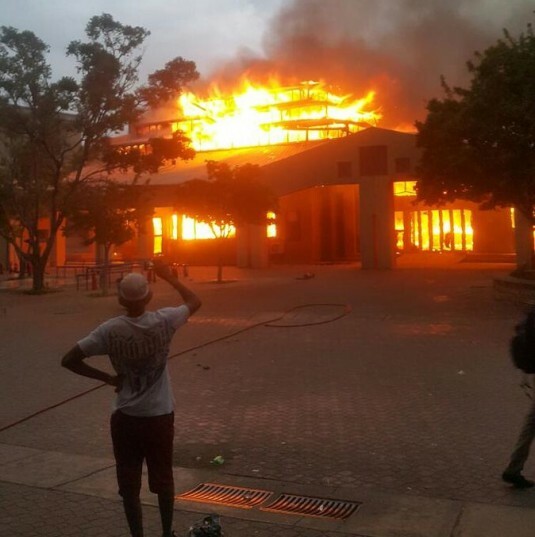 It was not students who set fire to a building at the North West University (NWU) Mafikeng campus, but it was management themselves who did so in trying to frame students affiliated to the EFF Students Command (EFFSC), suspended SRC president, Benz Mabengwane said. Speaking to The Citizen on Thursday morning, following the violent protest at the university which saw an administration completely torched on Wednesday, Mabengwane said disgruntled students attempted to raise a point during the inauguration of the newly appointed SRC members, but university management called in security officials to come and manhandle them. He said students made it clear that they will never recognise the newly-appointed SRC members, as they regard him as their only legitimate leader. “They asked me to address them and I did exactly that. “I said to them they must know that an appointed leadership can lead to dictatorship,” he said. Mabengwane said he appeared before a Disciplinary Committee (DC) on February 15, and the hearing was concluded on February 16. “Till today, I don’t know what the outcome of the DC is, but I don’t care even if they fire me because they will never kill our ideas. “The reason for dissolving our SRC, according to management, was that we are incapable of performing our duties….what is incapable of performing our duties when we call for the total scrapping of outsourcing and for the library to operate 24 hours,” Mabengwane said. “We don’t care, but they must know that once we come back here, they must just reinstate the democratically elected SRC members or else we will do it by force, ourselves,” Mabengwane said. During Wednesday’s violent protest, it was reported that protesting students also set fire to a motorcycle belonging to a staff member as well as a trailer belonging to the security company.